The reliability of a power system directly depends on the efficient functioning of its equipment especially in the wake of greater integration of variable renewable energy with the grid. Substations transform the voltage from high to low and house the various equipment required for transformation, switching, regulation and protection of transmission and distribution systems. Switchgear is one of the most important and critical components in an electrical system. It includes all the devices that ensure power system protection and regulate power supply. Switchgear de-energises equipment and clears faults in the system, thereby, ensuring reliable power supply. Electrical switchgear is necessary at every switching point in the electrical power system. Besides the power system, switchgear is also used in the commercial, residential and industrial sectors. The switchgear comprises devices associated with power system control and protection such as switches, fuses, circuit breakers and relays that are used to control, protect and isolate an electrical equipment to enable continuous and reliable supply of electricity. The use of switchgear helps in protecting against situations of overload, short circuit, insulation failure etc. Power system protection is a bough of electrical power engineering and it is designed to continuously monitor the power system to ensure maximum continuity of electrical supply without damaging equipment. Since power system developments change its structure, the power system protection becomes very vital. The switchgear industry in India mainly covers low voltage switchgear (with a rating below 1 kV) products. With huge emphasis on electrification, the medium voltage switchgear (with ratings between 1 kV to 33 kV) requirement is expending at a rapid pace. The demand for high voltage and ultra high voltage switchgear is also picking up on the back of investments being undertaken by the government for the development of high voltage and ultra high voltage transmission infrastructure. In addition, with the continuously increasing renewable energy capacity, switchgear has become pivotal in ensuring that networks operate in a synchronous manner with minimum faults. Further, modern business requirements call for upgraded switchgear that can ensure safety, reliable power supply and continued business operation. The design of switchgear has to ensure that it will be able to detect abnormal or undesirable conditions and then trip the circuit to disconnect the affected area without affecting other undesired areas. Air-insulated switchgear and gas-insulated switchgear are the most widely deployed switchgear technologies in India and worldwide. However, there are several modern technologies available now including hybrid switchgear, green switchgear and intelligent switchgear that are more compact, environment friendly and smart. The switchgear industry has witnessed technological advancements across all voltage levels. Industrialist are constantly trying to develop different kinds of switchgear that is more compact, reliable and environment friendly, and require minimum installation and commissioning time. The technology and range of switchgear varies across different segments of the grid, depending on the voltage level. Based on the load-bearing capacity, the switchgears are categorised into three segments – low voltage (LV), medium voltage (MV) and high voltage (HV). The LV switchgear segment includes switchgear rated up to 1 kV, the MV segment consists of switchgear rated up to 33 kV, and the HV segment includes devices rated at 66 kV and above. The key consumer segments of LV switchgear include distribution utilities, industries, residential and commercial buildings, and agricultural consumers. Common LV switchgear devices include air circuit breakers (ACBs), moulded case circuit breakers (MCCBs), motor protection circuit breakers (MPCBs), miniature circuit breakers (MCBs), residual current devices (RCDs), switch fuse (S/F) and fuse switch (F/S) units, high rupturing capacity (HRC) fuses, thermal overload and protection relays, connectors, starters, distribution boards and switches. MV and HV switchgear is often categorised as one owing to its usage and applications, which are mainly in power systems. MV switchgear includes various types of circuit breakers such as air circuit breakers, minimum oil circuit breakers and vacuum circuit breakers. For the MV and HV segment, transmission and generation utilities are the key users. Depending on the insulating medium, HV switchgear is classified into three major types – air insulated switchgear (AIS), gasinsulated switchgear (GIS) and hybrid switchgear (HS). The different kinds of switchgears can also be classified on the basis of their load bearing capacity (or voltage class), the medium used to interrupt the current, the interrupting rating (which is the maximum short circuit current that the device can safely interrupt), construction type, operating method and type of current. As per the construction type, switchgear is classified as indoor, outdoor, industrial, livefront, dead-front, open, metalenclosed, metal-clad, arc resistant etc. With regard to the method of operation, a switchgear is classified either manually operated or motor/stored energy operated, or solenoid operated. Meanwhile, depending on the type of current, it operates either on alternating current or direct current. In addition, based on the medium used to interrupt the current, a switchgear is classified as either a simple open-air isolator switch or it may be insulated by some other material like oil and vacuum. New developments in the switchgear industry are vacuum switchgear, hybrid switchgear and intelligent switchgear. Vacuum switching widely used in the medium voltage range, is also emerging as an alternative in HV applications. This trend is being driven by the fact that the vacuum switchgear is more environment friendly than SF6 switchgear. Hybrid switchgear is a combination of conventional air insulated switchgear and high voltage gas insulated switchgear. With the development of smart grid, the smart switchgear has also become popular. It is also capable to handle increasing integration of variable renewable energy into grid. Owing to an increasing focus on conserving right of way and ensuring uninterrupted power supply, power utilities are focusing on substation and switchgear technologies that require less space and have a reduced outage. Historically, air-insulated switchgear has been the most commonly used switchgear in India due to the low price. However, gas-insulated switchgear, which use sulphur hexafluoride (SF6) gas as the insulating medium, are picking up pace and gaining popularity, is the emerging as the preferred technology in India, especially, in the transmission segment. Its compact and encapsulated structure makes it ideal for areas with space constraints. This kind of switchgear is also suitable for use in locations with severe weather conditions (high temperature and high altitudes) and in industrial environments. GIS substations require approximately 35 per cent less space than AIS substations and have lower maintenance and outage costs. Although the initial cost of GIS substations is about 50 per cent higher than that of their AIS counterparts, the overall capital costs are comparable. Utilities can also opt for a hybrid switchgear – based substation, which is a mix of AIS and GIS technologies. 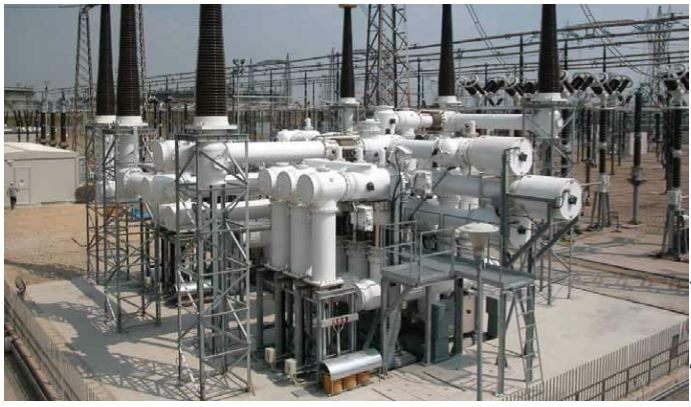 In a hybrid substation, the busbars are air insulated and all other equipment such as circuit breakers, bushings, busducts, connecting elements, disconnectors, current transformers and sensors are gas insulated. The initial cost of hybrid substations is approximately 20 per cent higher than that of AIS, and these substations require a moderate size of land. Ultra high voltage (UHV) and smart switchgear are the other key emerging technology trends. The growing demand for greater transmission of power over long distances and with lower losses necessitates the more to UHV or EHV transmission technologies at 800 kV, 1100 kV and 1200 kV. Powergrid has commissioned the (+/-) 800 kV North East Agra UHDC link, (+/-) 800 kV ChampaKurukshetra Bipole and the 1200 kV UHVAC Bina National Test Station. It is currently executing the (+/-) 800 kV Raigarh-Pugalur UHVDC link. These large UHV systems require switchgear that can meet safety, performance and reliability demands. With the increasing integration of renewable energy into grid, there is a need for automatic switchgear solutions that provide better monitoring and control capabilities. To meet this demand, smart internet of things ready switchgear solutions are coming, which can connect to the internet to provide real time monitoring, predictive diagnostics and better protection against faults. These switchgears are embedded with intelligent electronic devices and are preprogrammed for the remote monitoring and communication of key electrical parameters like current, voltage, faults etc. This facilitates the automatic regulation of incoming and outgoing power, transfer of power during peak load, and opening and closing of switches to maintain power load. Smart switchgear can also be seamlessly integrated with energy management, building management, supervisory control and data acquisition and other enterprise-level utility systems to control power flow and achieve energy savings. In smart grid operation, automated switchgear operation is preferred over conventional operation. In conventional substations, all signals, controls and interlocks are hardwired and records are manually maintained in a logbook. Therefore, a lot of work and efforts is required to draw comparisons for analysis and trouble shooting. An automated substation, wherein all operations are automated, is more efficient and requires less manpower. It also promotes energy efficiency and ensures better utilisation of assets thereby, smartly handled the uninterrupted power flow through smart grid. Traditionally, remote terminal units were used in substations as a link between the switchgear and the control centre. Some of these remote terminal units had intelligence features such as interlocking features, but no substation or region-wide automation was available. However, now more and more remote terminal units are being replaced by or complemented with specialised intelligent electrical devices that are capable of multiple protections and measurements in smart grid operation. In addition, intelligent gateways and concentrators have been introduced in the substation. In smart grid operations, monitoring and signaling are becoming an integral part of the switchgear, in addition to protection and control functions. Manufacturers are including intelligent built-in protection and control electronic devices in the switchgear to enhanced grid efficiency and reliability. Over the past few years, several technological solutions have emerged that have contributed significantly to enhancing the operational efficiency of utilities and to scaling down costs, making projects more viable. Digital switchgear and substations are one such solution which offers a range of benefits to utilities. To begin with, they are equipped with advanced software solutions that protect systems from potential cyber threats, thereby, strengthening system security. Further, all the auxiliaries of the digital switchgear are automated, enabling faster implementation of future technological solutions. Moreover, since utilities can track real-time data from substations and remotely control specific functions of the switchgear, it provides operational and financial benefits. Real time monitoring of data also reduces outage time and increase reliability of the system. In addition, digital substations and switchgears possess backward compatibility, which enables the smooth integration of new communication technology with the utilities existing systems. Other benefits of digitlisation is reduced maintenance costs. This is primarly because utilities can monitor and control parameters in real time, thereby, reducing the need of periodic maintenance. Apart from the operational and financial benefits, digital switchgears have another crucial purpose. Through compact primary equipment and smaller relay rooms, they reduce the substation footprint, thereby, allowing utilities to use the remaining space more efficiently. Digital switchgear also entail a lower installation time, since there are fewer panels to install and fewer cables to be pulled, connected and tested. The substation and switchgear industry is set to grow rapidly in the coming years. So far growth in the switchgear industry has been driven by a strong demand for low voltage and medium voltage switchgear from distribution and sub transmission networks. However, in the last year, the growth in demand for high voltage switchgear was greater than that for low voltage and medium voltage switchgear. In the coming year too, the demand for high voltage and ultra high voltage switchgear is expected to drive the growth of the switchgear industry. With various transmission and distribution strengthening initiatives being undertaken by the government and the target to achieve 100 per cent household electrification, the switchgear market is likely to continue on its growth trajectory. Various central government schemes aimed at strengthening transmission and distribution networks such as the green energy corridors, IPDS and DDUGJY, and at expending electricity access such as Saubhagya are also playing a key role in spurring equipment demand. The expansion of HVDC and HVAC transmission projects as well as launch of the smart cities initiatives is expected to further drive the demand for advance substation and switchgear solutions. Switchgear industry is a well established and equipped industry with continuously developing technologies to support this growth. The transmission voltage landscape has been shifting towards higher voltage as it enables the flow of more power and integration of renewable energy. This is also evident from the current 25 percent share of the 765 kV voltage level in powergrid transmission lines against only 2 percent in 2012. The upcoming trend in the transmission segment is that of the UHV network. The power transfer capacity of a UHV line is around 4 times higher than that of 765 kV line. It will increase the demand of HV and UHV switchgear and associated equipments. With the pace of government initiatives for development of smart grid, there is need to develop different kinds of switchgear suitable for smart grid operation and that is more compact, reliable, environment friendly and requires minimum installation and commissioning time. Moreover, as the pace of renewable energy integration increases, utilities would be required to increase the deployment of intelligent switchgear or to undertake modifications to transform the existing switchgear modules into smart switchgear.